Much like Steven Wilson allegedly considers Porcupine Tree’s ‘On The Sunday of Life’ to be comprised of “failed bedroom experiments”, the almost unfinished nature of the original ‘Ghosts’ obviously plagued Blomgren as the years passed and at the end of 2018, he unleashed a new recording. The 2018 version of ‘Ghosts of a Fallen Soldier’ isn’t just a remix with a few overdubs, but a drastic re-working. With Becoming The Lion now a full band at some point during the interim, every opportunity has been taken to improve on those original musical ideas with real drums and chunkier guitars used throughout. It so obviously stood a great chance of being a successful re-imagining on that basis, but the addition of vocals – turning these musical soundscapes into actual songs – means that it is much broader in appeal for the awaiting audience. Dropping the original layer of synths for an electric piano sound with a massive delay, the new ‘Ghosts’ wastes no time at all in flaunting its improvements. The marriage of the keyboard riff with a mournful guitar and heavily treated vocals during ‘Rally At The Battlefront’ is instantly reminiscent of The Pineapple Thief at their finest. After introducing an overtly loud drum, a deep bass and finally a chugging guitar, the prog rock surrenders to post-metal heaviness, but manages to do so without alienating those who’ve had their ears prick up thus far. With the main groove firmly established, the vocal rises into a series of impassioned cries; the feeling of a melodic hook is strong even if a chorus really isn’t, and pulling through to the climax, it’s obvious that finally Becoming The Lion have found their true musical calling. Taking an equally spacious approach, but stoking up the riffs, ‘Ready Aim Fire’ provides an instant highlight. It’s deep bass contrasted with almost ambient guitar sounds works excellently, while a hushed and slightly treated vocal accentuates the proggy edge. There’s a familiarity to the overall sound – especially if you like bands like Ashes Divide and Team Sleep – but that familiarity doesn’t mean the result resembles purely recycled sounds. Of particular note throughout are the real drums, laying down an almost tribal groove – a vast improvement over the 2010 recording’s mechanised rattling – and the closing section which, again, shows how this three piece band can lock into a tight Deftones inspired sound with ease. ‘Why?’ reinstates some brilliant electric piano sounds, while drum machines and drones revisit the original recording’s home-spun origins, but with the help of a far better mix, it leaves behind a short looping instrumental that’s quite appealing, before a short intro featuring droning keys, ‘We Should Have Turned Back’, suggests fear and darkness and quickly reawakens memories of 1980s Tangerine Dream soundtracks. These tracks allow for some reflection before the very moody ‘Too Late Now’ explores a particularly shadowy soundscape and some of the record’s heaviest music… Dominated by bass, there’s a heavy post-metal vibe, but the addition of echoing vocals combined with the lack of guitars also has hints of latter day Porcupine Tree and Pineapple Thief at play. Once a heavily detuned guitar adds an extra layer of sludginess, it almost sounds more like a prog metal take on the Deftones’ sound, but any potential dirge qualities are counterbalanced by a clean ringing guitar – far too low in the mix, but it’s there – and an emotional detachment from the vocal. For prog metal lovers, the second half of the track will really grab the attention when the moody riffs submit to an incredibly heavy riff that makes great use of a juddering rhythm. Finally, ‘I’m Fading Fast’ hits hard with a deep drum groove and a downtuned riff. Musically, it presents some fine metal oriented sounds, but since it strips back the prog, it isn’t always as interesting as a couple of the previous numbers. As if completely self-aware of this, there’s a concession made for a chorus – finally – and multi-layered vocals deliver an understated hook that sits brilliantly atop an arty riff. Between the off-kilter rhythm, huge drums and ringing guitars, there’s something here that might pull in fans of Oceansize, but in terms of mood, this disc features much better music elsewhere. Despite an underwhelming ending, ‘Ghosts of a Fallen Soldier 2018’ is mostly brilliant. The music has a strong presence throughout and the addition of vocals definitely makes this an entirely different beast to almost everything Becoming The Lion have released previously. This is the kind of record that will expand their audience – possibly considerably. If you like the heavier moments on Pineapple Thief records, the Deftones when they opt for arty quietness (which is nowhere near often enough), or perhaps can’t get enough of Awooga’s 2018 LP ‘Conduit’, this is a record you just can’t afford to miss. 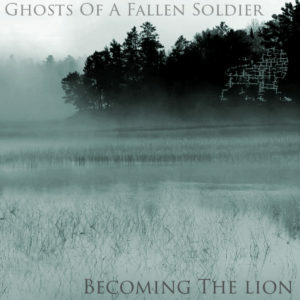 This entry was posted in Album & EP Reviews and tagged becoming the lion, metal, post metal, post rock, prog, prog metal, rock, stream by Real Gone. Bookmark the permalink.